As a Guild Master, I would like to know how much money my guild is spending per day for guild repairs by rank. As a Guild Master, I would like to know how much money my guild is spending per day for guild repairs by rank. This will allow me to predict expenses and cost changes, as well as see at a glance if actions need to be taken to prepare for upcoming events (such as the release of a new raid) or if the current balance is sufficient. It would be nice to have a "price source" that references your current gold amount. Obviously it wouldn't be useful in auction operations, but would be quite useful in things such as sniper operations. That way you could set the upper limit that you would pay to either your current gold on hand or a percentage of same. There is an "ignore random enchantments" but since you can get the same item at iLvl 300 or 310 and the price difference is big, is it possible to have it track the rarity of the item as a seperate item to sell? The default date range for showing the gold income on the dashboard resets to "Past Year." TSM should remember my preferred default date range. This applies to both Gold Income and Sales Summary. The smoothest implementation would be to save my last used setting, or alternatively, add a setting for default date range. Currently the dashboard is able to show the amount of gold the sum total of all your characters possess, but I believe that adding in a section that also goes over a summary of your non-liquid value would be helpful. I would say the option would need to be able to select between character and all your characters (or maybe a combo-button option if you only care about the amount on a few characters). Just a simple chart with a few data points that would show the total value of items and mats based on salesavg,martketvalue, and maybe regional sales avg. I mean this information is already being fed into TSM and shown via the tooltip per single item, so another drop-down or combo-box to select what you want the valuation based on would be excellent as well. -Allows players who stockpile specific materials and items for their niche market to determine easily much they still stand to make. For example, right now my bank toon has been stockpiling materials since BFA launch. Problem is that I just keep seeing what I've spent and my total "losses" at this point. Being able to see what the actual valuation of what I have would allow me to see how much I've actually made or loss based on what the valuation of my materials and items is now. So I've spent 960k so far, but what's that actually worth now? TSM already has all the data listed in the tooltip so I know it's got the numbers necessary to do the simple multiplication calculation to determine total valuation for everything. So it's not even asking for much then just to have TSM do the math instead of a player manually find the information in the tooltips and creating a spreadsheet and manually entering all the information in themselves. I miss the old Items view from TSM3, it was incredibly useful for getting an overview of your sales from a quantity point of view. The same holds true for the old summary view that's now been merged into the dashboard. The ability to drill down on specific groups to look at your sales and purchases over different time periods was incredibly useful to notice trends and improve decision making. Calculate and display the value of everything in your bags, bank and guild bank based on DBMarket or some other source string. At current Accounting seems to only take in to account AH & Vendoring. Also how is a Repair bill a revenue? Tooltip to see of much you are undercut disapeared. Hello, in TSM3, when seeing "Below min price" you could just hover the item to see what was min/max buyout. Now you cannot know quickly if you are undercut by 1gold or by 1K. It's really annoying because you can't even click the item to have the detail. You need to go make a search for EACH item. I haven't been using the addon long, but today I found that while trying to post items I got the "item under minimum, not posting" comment. Upon investigating I found that it was a bid that was under the minimum I had listed. All the other postings were above my minimum by a fair margin. I suggest an option to ignore only bids when posting. This may seem trivial (or it might be impossible due to coding) but it seems a way to manipulate other users of addons like this, and may be easily avoided. As an enchanter who sells old world enchants I have a lot of stock. A little bit of this kind of dust, some various greater essences, all sorts of shards - you know the pain. I would like to be able to hover over these items in my bank and determine how many of them I use on (for example) a monthly basis. If some of them haven't been used enough I can convert them to something more usable or sell them! I have made 5 Enchant Weapon - Exceptional Spellpower this month. I want to know how many of an item I've used in the past month so I select the option so see how many I've used in the past 30 days. When I hover over Infinite Dust it should say (50/30 days) and Greater Cosmic Essence should say (10/30 days). Let's say I never use Volatile Water or at least haven't in the past month. When I hover over it I would see (0/30days). That way I can reconsider how much space that Volatile Water is taking up in my bank. I think a daily/weekly/monthly/ever option would be useful. My setup involves 3 accounts: 1. is my crafter 2. is the acocunt I use for selling my stuff and 3. is my sniper. So I can snipe, craft and running scans at the same time. Since my seller doesnt know the prices from my buyer, he often refuses to sale/undercut, since he thinks mats were bought more expensive. If the accounting information would be shared and/or saved in the same file, this wouldnt be a problem anymore. A lot of people use at least 2 accounts (snipping and playing) so I am sure this would be usefull. I hope you can implement that. I can't find anything to tell me the value of this throughout TSM, this would result in inaccurate accounting information if not included & may mislead a lot of people if all they see is their postage expense. Every tab but `Summary` and `Player Gold` should have an actual summary below the table. Like in the linked image. First off all, i use the mobile app to buy items and sometimes resell them directly withouth it ever hitting my ingame mailbox (to collect it with TSM active). After the item that i directly relisted expires it ends in the mailbox withouth any pricing info (the price that i've bought it for). 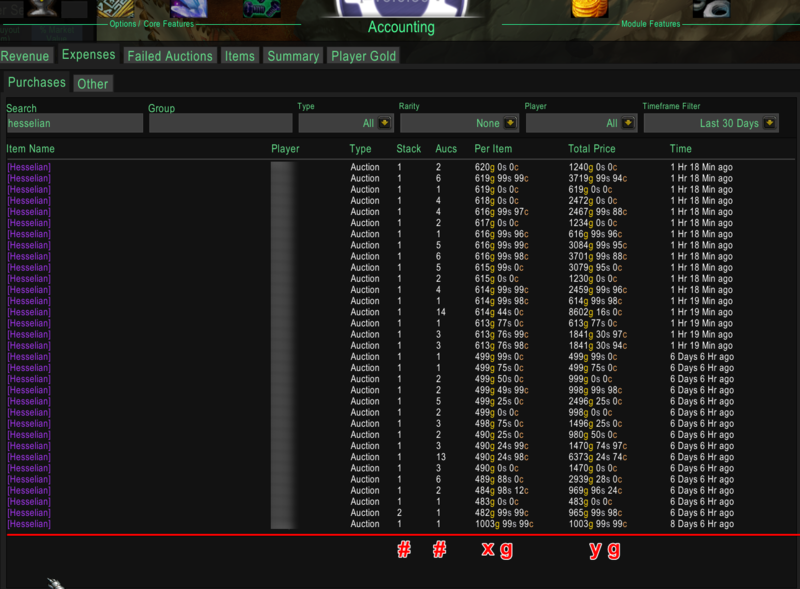 Using TSM (in-game) -> Select an item in your inventory or bank -> get a field to adjuct prices (i.e. buy/sell price) -> apply it. Hiya, as discussed on discord. 3 months of data is not very much at all, especially for flippable items for old world mats. Can there be an option to clear all but the last year (or 6 months I suppose). I know this isn't something that you view favorably due to the large amount of data TSM has to work with, but this is a compromise for packrats like me who have kept data for years and years.